What makes a great mobile app stand out from the majority that never get used? Today we share some of our favorites and what makes them home screen essentials. Companies are quickly bridging the cross-channel gaps to deliver enhanced experiences through mobile technology. 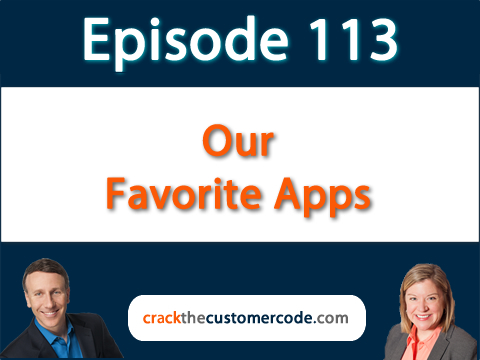 From apps like TripIt that help organize travel details to retail apps that use geolocation to help customers find the products you need most, Adam and Jeannie talk about their own favorite apps. Both having extensive backgrounds in customer-focused practices, an app has to be really great to stand out to customer experience pros like our hosts! Only 16% of mobile apps get used more than once! And why do most of them fail? Many companies create apps simply because someone in a high place has set a goal to have one. And while there are a number of reasons an app might fail, it’s often because they are created without considering the goals of the actual user. So do your customers need an app? Before you jump in and design a mobile experience, Adam and Jeannie share the secret sauce behind some great apps that truly drive loyalty through improved experiences. Do you know how to deliver the superior customer experience you visualize? We can help your team become a force for positive change, starting with a customer-centric mission. The Customer Experience Investigators™ at 360Connext specialize in helping companies across industries and around the globe develop and internalize unique and scalable customer-focused missions. To compete with the other 89% of companies staying afloat by providing better experiences, you need a compass for making astounding changes in the customer experience while breaking down the silos that are holding you back. We offer evaluations, workshops, and roadmaps to keep your wheels firmly planted on the road to a customer-centric future. Join us on our mission to Create Fewer Ruined Days for Customers™ today. Visit us at 360Connext.com.